Flawed hearings made a mockery of constitutional requirements. Parliament has failed dismally to consult the communities most affected by the Traditional and Khoi-San Leadership Bill. The recent parliamentary hearings on the Traditional and Khoi-San Leadership Bill made a mockery of the constitutional requirement of meaningful and substantive consultation in the development and passing of laws. Unlike those of the Western Cape, the people of the mainly rural Northern Cape and Eastern Cape were not properly consulted. In some cases people waited in vain as MPs failed to arrive on the scheduled date for the meetings. After numerous postponements, the chairperson of the parliamentary Portfolio Committee on Cooperative Governance and Traditional Affairs (COGTA), Richard Mdakane, launched the first round of the public hearings programme in November 2016. Hearings were held until December 2016 in the Northern Cape, Western Cape and Eastern Cape, then early this year in North West, Free State and KwaZulu-Natal, and finally in Limpopo, Mpumalanga and Gauteng. To combine all the laws on traditional leadership into one law and address all problems with current laws. The point of public hearings is to allow the Committee to draw from people’s input to make changes to the Bill, or even, if necessary, to send it back to the drawing board. However, we know from the earlier Traditional Courts Bill that there is no guarantee that a committee will take people’s inputs into account in influencing the direction of legislation. Instead of summarizing all the inputs to build a comprehensive report, the final Traditional Courts Bill of 2012 ignored the majority of submissions to the Portfolio Committee in an extensive public participation process. Thus, public consultation can also in practice be an exclusionary political exercise that does not reflect people’s interests. If the portfolio committee is serious about public participation in the Traditional and Khoi-San Leadership Bill , its report should reflect that the process in the first round of the hearings was flawed. Did the Committee do as required to call and cater for people’s meaningful engagement with the Bill? The answer is an unequivocal ‘no’. There was no translation offered to the indigenous people that Parliament claims to recognise. People had to contribute on the basis of a 10-minute summary of the Bill that was not even projected to them. People were asked to make submissions on a 95-page contested Bill that they were hearing about for the first time, presented in English and poorly translated by volunteers from surrounding communities. This is the reason why hearings lasted for at least 3 hours. What meaningful contributions could be made? In contrast, in the urban setting of Parliament in Cape Town, there were translators and a summary of the Bill was both issued and projected to the participants. People who went to the Western Cape hearings had access to facilities and information that people in the Northern Cape did not have. At a minimum, the Members of Parliament should have travelled with translators and provided copies of the summary to people in rural areas. It was Parliament’s responsibility to include all those interested, regardless to their location and class status. Despite communities’ varying locations and disparate treatment by Parliament, people did not hesitate to object to the Bill, which seeks to recognise traditional leadership within colonial and apartheid boundaries without first attending to imposed chieftainships. The chairperson’s frequent remarks at the Northern Cape hearings that people were making irrelevant comments showed that either people had not been properly informed about the Bill or that the Bill is flawed and the committee itself did not recognise the relevance of the comments. Another disturbing aspect of the hearings is the distorted way in which the Bill was presented to the public. In the second phase of hearings, Mdakane told people that other communities at previous hearings had accepted the Bill and called for its urgent amendment. This was not entirely true; many people loudly rejected and criticized the Bill. The few people who asked for the Bill are those who only mentioned the importance of the ‘recognition of the Khoi-San communities’ and did not dwell much on other problematic issues of traditional leadership in the Bill. The other concern, not only with this Bill, is whether or not MPs are committed to understanding the issues they deal with. Do Members of Parliament actually engage with the documentation that comes before them in order to make reasoned decisions? Do they seek to have a strong understanding of the laws that they pass? How does one assess that? There might be a role for civil society to help MPs in their understanding of the implications of proposed legislation, but the party with the majority in parliament seems foreign-funded civil society organisations as a threat. 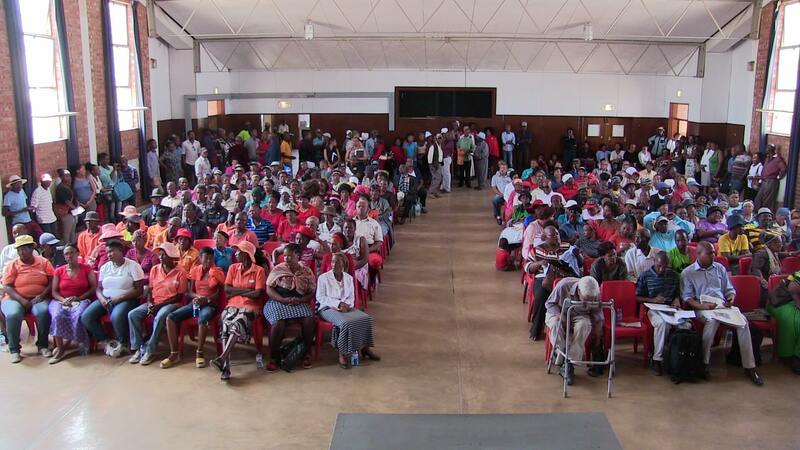 Political analysts have suggested that following the massive knock the ANC took in the last local government elections, the party’s road to recovery might lie with the rural vote. These hearings were an opportunity for the ANC to secure this vote. Yet the party stripped people of their prerogative to participate in law making processes. If Parliament continues like this, it is opening itself to Constitutional Court challenges like the ‘Doctors For Life’ case over public involvement in the law-making process. In that case, the Court delivered a stinging rebuke to Parliament for inadequate consultation and laid down benchmarks for adequate listening. Parliament should increase public participation in a meaningful way by rescheduling public hearings in the communities which have not been properly heard. And Members of Parliament should read and understand their documentation before and after the hearings, to reassure the public that public hearings are not just about ticking political boxes and that Parliamentarians are truly informed.